Exploring the flip side of the seaside. b-side present contemporary art in an accessible way. Working with artists and communities, they use unusual places for installations, performances and much more. They are committed to bringing art outside, allowing artists to create in response to places that communities can access and enjoy. We have worked with b-side since 2009, building their brand and helping them plan their biennial festival marketing and providing effective design which helps bring more visitors to their experiences. From developing their website in order to showcase their wonderful work, to signs, clothing, brochures and maps, we've helped make the festivals more enjoyable and accessible for their visitors. 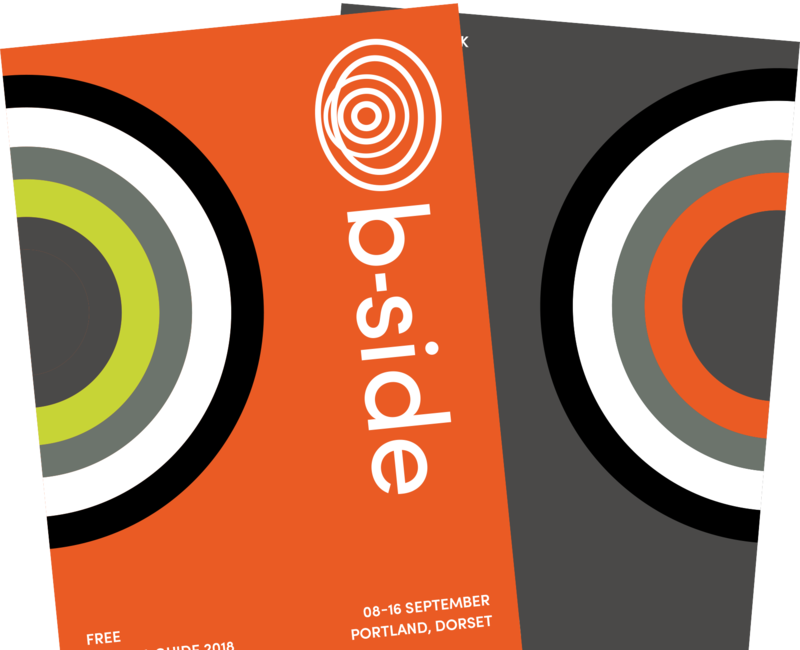 Beginning life with the idea to explore "the flip side of the seaside" and present an alternative take on life in South West coastal towns, b-side has grown rapidly from a modest weekend of events in 2008. Now they are the borough’s only National Portfolio Organisation, funded by the Arts Council England. Each festival attracts tens of thousands of visitors to Portland every year. b-side delivers a lot for the size of their team. If you meet anyone involved with the festival shortly after it has finished, you'll understand just how much work they put in! We help the b-side team not only with design, but with planning, budgeting, support (including biscuits) and delivering their marketing over the whole two year festival timeline. Their design also has specific requirements. With a complex and busy programme, and a varied audience with a wide range of accessibility needs, b-side needed their programme presented in very clear brochures, maps and signage to help visitors navigate the festival with ease. b-side’s identity is rooted in it’s location on the beautiful and intriguing Isle of Portland. We wanted the brand to reflect this sense of place. Initially we explored the idea of 78 records, quite literally the ‘flip side of the sea side’. Record sleeves provide a rich history of bold typography, iconic design and circular imagery. Later we explored the topography of the island; contour lines, geographical surveys, geological mapping. From these we developed the idea of lines radiating from the central point; Portland as the marker from which b-side grows. The b-side branding was initially designed in 2010, but a lot of things have changed and developed within the organisation during that time. In 2015, the branding required an update and a refresh in order to accurately reflect b-side's personality and message. Initially, we held a workshop with the team to establish the identity behind b-side, before exploring the different routes to take. We then redeveloped the logo, identity guidelines (font, colours) and visual stylings. In 2018, we developed the brand further to include a bolder colour palette and new 'bullseye' iconography. b-side also required a fully mobile friendly website to help visitors plan their visit whilst "on the move". The website uses calendars, interactive maps and events filters to help visitors easily find the details that they require. It also has extensive media integration to allow a wide range of media to be uploaded and shared. It includes social media feeds, and works well with third-party applications such as Eventbrite, to allow b-side to securely sell event tickets through the website. b-side relies on funders and donors, who can use the website to browse the key projects and clearly see the impact of their donations/funding. We’ve produced microsites, infographics and printed reports that help communicate to funders the invaluable impact of b-side’s work - and this in turn has enabled them to secure further funding. We also helped b-side to build a supporter's platform to allow visitors to become 'Friends of b-side' and set up regular financial donations. We have designed a huge amount of print output for b-side over the years, ranging from catalogues to postcards, brochures to billboards. Working with b-side is always enjoyable because they embrace creative ideas and are ambitious with their goals. Some of our favourite projects have been developing printed brochures for the festivals, as they are packed full of interesting content and bespoke artwork created by their commissioned artists. Brochures have included free 'pull out' posters, unique illustrations, beautiful photography and subtle hidden surprises within the content. Arts Council England used the b-side website as an example of a website that demonstrates "good practice" in terms of responsive mobile-friendly design. The website works smoothly on all mobile and tablet devices. During the festival, the b-side visitor traffic rockets - with thousands of visitors and upwards of 400% increase in traffic on busy days. Therefore the site needs to load smoothly and quickly for all visitors, including those in rural locations on weak 3G connections.